It was a wonderful Wednesday, the July 19, 2017, H H Sri Sri Sri Tridandi Srimannarayana Ramanuja Chinna Jeeyar Swamiji extended Mangalasasanams to the students and staff of JIMS Homoeopathic Medical College & Hospital. The day had begun with the showers of blessing in the form of good rain right from the morning. All were eagerly waiting to see Swamiji. Finally the auspicious moment arrived. H H Sri Sri Sri Tridandi Srimannarayana Ramanuja Chinna Jeeyar Swamiji kept his Lotus Feet at our campus at sharp 3pm. H H Sri Sri Sri Chinna Jeeyar Swamiji, H H Srimannarayana Ahobela Swamiji, Mr. Suryanarayana and few other dignitaries were ushered by the Director Dr Arvind Kothe, Principal Dr K Raghuramchandra, members of teaching and non-teaching faculty with students to enter the Auditorium. 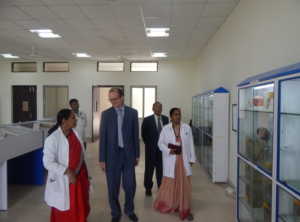 The program began in a high note with welcome address by Dr. K. Kalpavali Assit. Professor, Department of Organon of Medicine& Homoeopathic Philosophy, followed by prayer song by Ms Priyanka. HH SriSri Sri Chinna Jeeyar Swamiji lighted the lamp to dispel the darkness of ignorance from students along with the chorus “ Guru Parampara “ played by A. Shivani, N. Sahithya, S. Vineetha, K. Pragnya of II BHMS. To mark the occasion Ms Srilatha Yadav spoke on experiences of her stay in the campus for the last two years and recollected the previous visits of Swamiji and the bountiful benefits received by them. 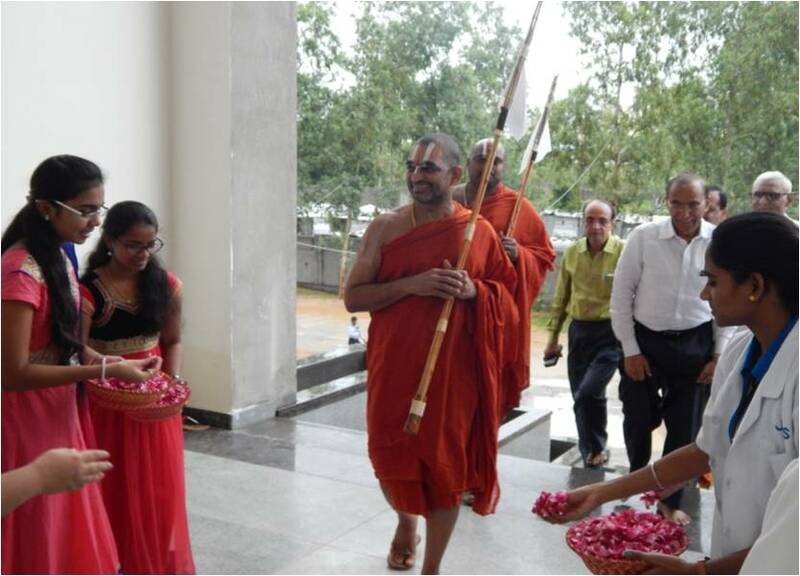 H H Sri Sri Chinna Jeeyar Swamiji blessed everyone present on the occasion and appealed students to take-up challenges, and face them in a positive manner. Swamiji emphasized on the lesson of Life, how life should be, how much enthusiastically a person has to lead his life by facing some problems and finding solution and in learning many new things through the problems. He also spoke about how open a person should be in receiving various kinds of knowledge/learning and how they are important for a person during the time of need. HH Sri Sri Sri Chinna Jeeyar Swamiji stressed on developing communication skill and advised us how to speak, how to use the language. Swamiji said that our words can break or bridge the relation. He described how well or bad a person could be while using his/her language and words which ought to be spoken appropriately during the need and deed also. With this reference Swamiji spoke about the nature of doctors and he said that the words spoken by a doctor could give positive energy to the patient and his relatives. Sri Sri Jeeyar Swamiji explained that allopathic doctors treat mostly the physical complaints of patients but homoeopathic doctors take well care of people at their social, mental and emotional levels also. Hence students should attend classes not only for the sake of attendance but also learn from the teachers as well and they should give values to the teachers. Swamiji told students that learning could be a continuous process and every person should make him ready to learn many new things and to have right attitude and aptitude to give service to the society besides earning their living; and to learn balancing act in order to keep themselves and others survive. H H Ahobela Swamiji spoke about how a physician could be for the society with few stories and said that how good a doctor should be towards this community. Swamiji advised students not to think of only their earning after completing the course but to nurture the good qualities of a physician by attending the discourse of Philosophy. In the end Ms Mahek Singh, I BHMS student gave vote of thanks and it was followed by Vaishnava Bhajan, Vaishnav Janatho, sung by II BHMS students. 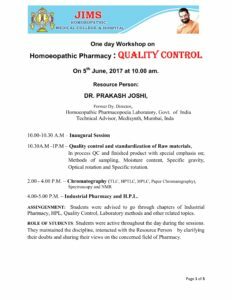 Dr.Pravas Kumar Pal, Professor Department of Pharmacy ,Dr.K.Kalpavalli, Asst.Professor, Department of Organon of Medicine & Homoeopathic Philosophy JIMS Homoeopathic Medical College & Hospital.